Top Ten Tuesday is a meme created by The Broke and the Bookish. Each week they provide a topic for a Top Ten list. 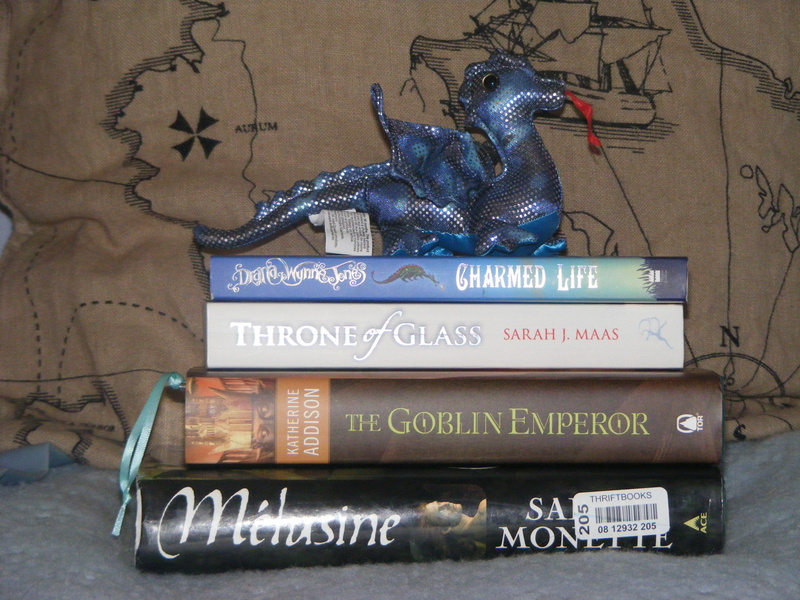 This week’s Top Ten Tuesday prompt was ‘Top Ten Book Characters That Would Be Sitting at My Lunch Table’. I thought about it for a while but then I struggled to imagine my favourite characters in a school setting so I thought ‘why not invite them to dinner instead?’But then I thought about Felix Harrowgate and how fights may ensue if I force everyone to sit around a table. 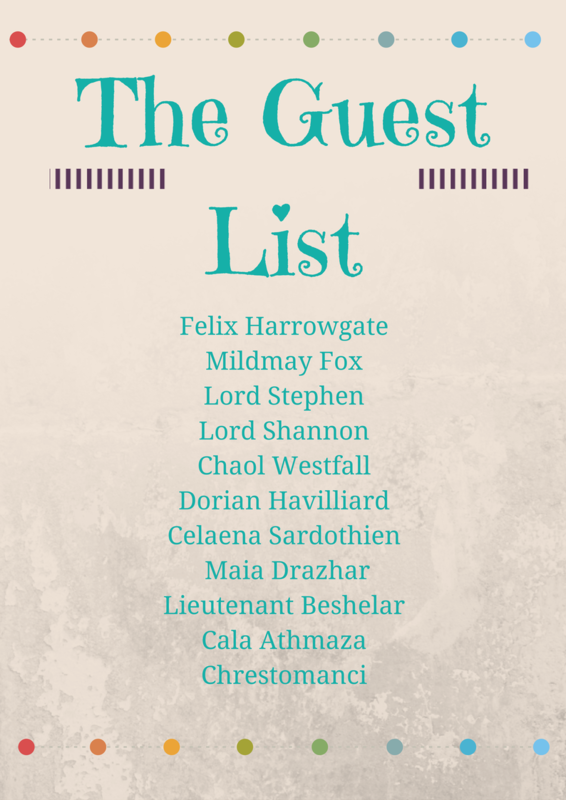 So, I have settled on inviting my favourite fictional characters to a soiree. At a soiree they can go off into little groups if they need to, but I can at least get them in the same room. 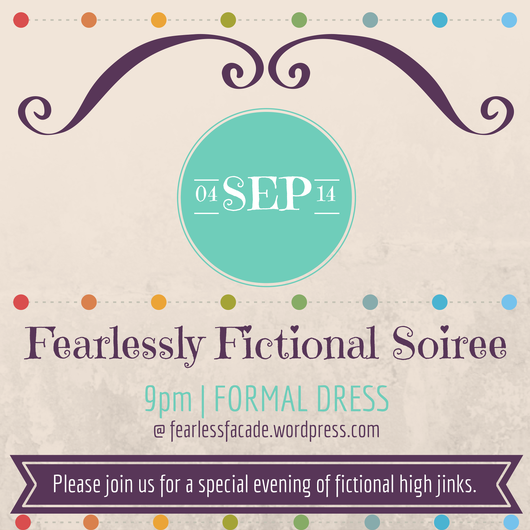 Long story short: After pondering what to do for Top Ten Tuesday this week I decided to twist the prompt a bit and instead hold my first edition of the ‘Fearlessly Fictional Soiree’, a party where fictional world divisions are torn down for one special night right here on the blog. My favourite characters can interact and dance with each other until dawn. From The Doctrine of Labyrinths series by Sarah Monette we haveFelix (a powerful wizard), Mildmay (ex-assassin and cat burglar, also Felix’s half-brother) , Lord Stephen (Lord Protector- the non-magic user in charge in Melusine) and Lord Shannon (Stephen’s younger, half-brother and Felix’s ex). From the Throne of Glass series by Sarah J. Maas we have Celaena Sardothien (trained assassin), Chaol Westfall (Captain of the Guard) and Prince Dorian (Crown Prince of Adarlan). From The Goblin Emperor by Katherine Addison (AKA Sarah Monette) we have Maia Drazhar (AKA Edrehasivar VII, the 209th Emperor of the Elflands), Beshelar and Cala (basically Maia’s incredibly deciated bodyguards). Finally, from the Chrestomanci Chronicles by Diana Wynne Jones we have Chrestomanci himself (AKA Christopher Chant, an enchanter with nine lives). Who do they mix with? Well, first of all let’s talk about Felix Harrowgate. One person Felix certainly won’t hang out with is Shannon. Instead Felix attempts to edge his way to the opposite side of the room to Shannon, which makes Shannon kind of sad. Shannon tries to distract himself by chatting to Prince Dorian about plays and books (and perhaps bonding over what it’s like to be important at court but still feel a bit isolated), while Felix is soon lost in conversation with Christopher Chant as they discuss the differences between how their magic systems work. Felix loves discussing theory. They are also both snazzy dresses. I think Christopher Chant can handle himself against Felix’s occasionally sharp tongue. After all, Chant has to deal with difficult people a lot in his line of work. Dorian is trying to overhear bits of Felix and Christopher’s discussion forreasons. Shannon [bearing in mind I’m imagining The Mirador Shannon]doesn’t mind too much that they are edging towards the magic-users who are too engrossed in conversation by this point to notice. On a slightly raised platform Maia and Stephen are casually socialising. They are very different men but I think they share a sense of practicality that will allow them to have a pleasant enough evening in each other’s company. They both know the trials of ruling people and doing what has to be done. Maia is rather inquisitive about the political landscape of the Mirador and it’s relationship with the Bastion and Stephen is happy enough to enlighten him. Beshalar generally spends his time looking stern but he meets Chaol’s eyes at some point and they realise they are both watching the room carefully for threats and then nod at each other with some respect. Later on at the party they cross each other’s path, have a laugh together and bond a bit. Speaking of threats, where is Mildmay and Celaena? Mildmay goes outside to get some fresh air, he’s not very interested in the hocus stuff Felix and Christopher are going on about. But Celaena recognises a fellow trained-assassin when she sees one and is soon on his tail. Mildmay sighs and looks at her, assuming she’s some flashy who wants to know about Felix. But Mildmay is the one Celaena’s interested in. She wants to hear about the Lower City in Melusine and she offers up a bit of her own story. There’s a grief there, tucked away, that Mildmay can sympathise with. Before long he’s telling a story, the worst story he knows about hocuses, and she listens. A dragon smashes up the building and eats everybody. No, I’m kidding. They just returned to their own books after an interesting evening out.